If there is a comic book franchise that demands a cinematic reboot like what Batman Begins did, then Judge Dredd/2000 AD is it. I must say though, that 1995's Judge Dredd with Sylvester Stallone is something of a guilty pleasure for me. I don't have it on DVD but whenever it comes on television, I always wind up settling back to watch it. It's what first drew my attention to the 2000 AD mythology. Judge Dredd from '95 did a lot of things right... but it also could have been so much more if you know anything about the comics. 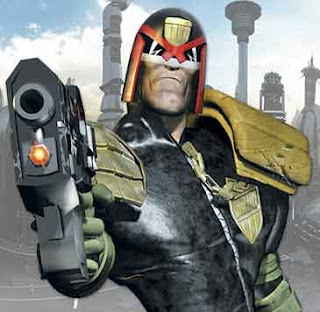 Well, hopefully Judge Joe Dredd and the world of Mega City One will soon be getting the big-screen treatment that they deserve: a new Judge Dredd movie has been greenlit. It'll be produced by DNA Films, which has recently brought out such sci-fi movies as Sunshine and 28 Weeks Later. Vin Diesel should play Judge Dredd. But not show his real face like the comic strip. I think Ron Perlman should be Dredd.